because the ideas of God go on for all of eternity." We went to one of our favorite produce markets and they had huge cabbages. I'd never seen any that big. The one I chose was 11 inches wide. I love cabbage and at the time I flashed back to my childhood on a food that I enjoyed as a child: Pepper Cabbage. It's a Pennsylvania Dutch recipe. 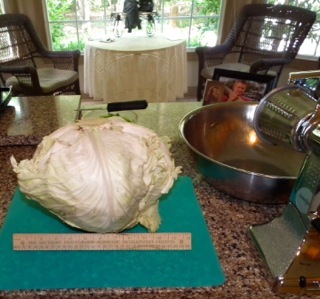 You have to like vinegar, but it's really easy to make once you have the cabbage shredded. I used my shredder to get that done and it seemed to take forever. But once I had a huge bowl full for us and a huge bowl full for the wildlife (deer seem to love cabbage too), I could add the chopped bell peppers. Then I made the dressing to pour over it. It tastes better if you allow it to sit in the refrigerator for a day. We have a neighbor here that lived in the Pennsylvania Dutch area as a child also and he enjoys this. That was my motivation for getting it made. His birthday was coming up and I thought it would be a nice treat for him. Grate as much cabbage as you want, chop as much pepper as you'd like and add. Then mix the vinegar, honey and spices in a jar, tasting it till it's sweet enough for you. Shake until well blended and pour over the cabbage. I use as little dressing as needed since I can stir the mix now and then while it's in the refrigerator. You won't have a lot of wasted dressing that way. We thoroughly enjoyed it, as did our neighbor. It was a labor of love with the difficulties I have in the kitchen. My hands are in rebellion since the middle knuckles don't bend. I believe they shall line up with the Truth of the Word as I renew my mind. Then I will spend lots of time cooking which is something I always loved doing. Life can become quite the challenge as bad circumstances seem to mount up the more we focus on them. I finally made a long-needed choice to renew my mind on circumstances. There are some that I can change and there are many that I cannot. I can meditate on the Word, or I can meditate on the things the devil throws into our lives to take our attention and love away from God. I chose to meditate on God's Word. Worry is meditating on what the devil is doing and it's something you can do even while you work or do household tasks ... so you can turn that time into meditating on God's Word which is alive and active. What that means is that the Word has the power to change our lives. And you will find that it does the more and more you fill your mind and thoughts with it. We can sing praises to God all day long. How awesome is it going to be ... to worship Him for eternity. Why not get started now!? One day Randal called me saying, "get the camera" so I grabbed it and followed his voice. He hadn't seen an orange spider before so wondered if I had. I had not. I couldn't see the detail of this spider until I took the photo and then magnified it. 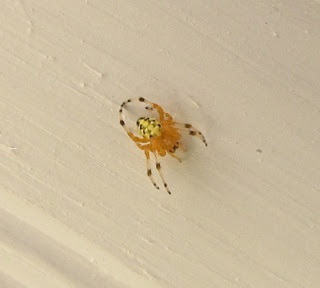 It was about 1/4" and all I could see was orange, but look at all the detail with the yellow-black pattern and those pretty legs. If I had to name it I would call it a Bee Spider. After having had such great fear of bugs for over 40 years of my life, I am so in love with the unique designs of bugs. It's such a huge avenue of seeing God's artistic creativity. Just imagining the millions of species of bugs and each one having a unique design of its own chosen by our loving Lord. It's a whole new realm of wonder to discover and the camera makes it so much more exciting! I finally got around to identifying this "blob" on a holly tree that I had pruned off before seeing it. It was very fibrous but looked like something had to have been inside it. I submitted it to BugGuide.net and found out it is the cocoon of the Cecropia Moth. I actually had the opportunity to photograph this huge beautiful moth about 5 years ago. There was one resting on the trim at the pedestrian door to the garage. We disturbed it coming out that door and it flew down to the concrete. Amazingly beautiful. Although it was a bit dark outside the unique pattern on this big moth was impressive. So, the moral of the story is ... if you ever see something like this on a bush please don't destroy it. There's something beautiful inside! 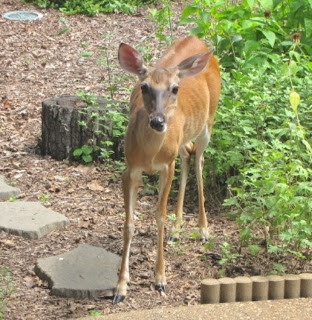 The injured female deer that I've mentioned before is still coming to visit our garden and back woods. We see her often since she travels about during the day. Deer usually graze at night but I'm sure she avoids doing that since the other deer are not tolerant of "abnormal" deer. When we first saw her they were chasing her off any time she came near trying to get some of the food put down for the doves and squirrels and the dropped food around the bird feeders. Recently we've seen her with two little fawns. 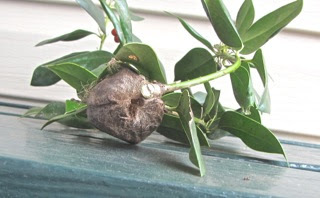 Love Deer - Previously Known as "Limpy"
We love Poke Weed plants since they provide so many berries for the birds in late summer and Fall. The deer enjoy eating the young leaves. We had one come up last year in the garden area in front of the house where we have plants for the hummingbirds and bees. I let it grow because Love Deer enjoyed it. 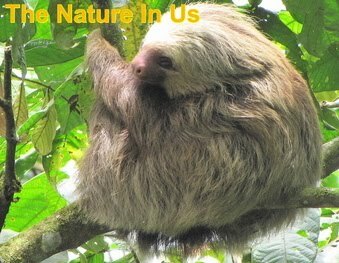 As you can see from the photo, she's at the walkway that's in front of our front door. She stands there and looks in the windows beside our front door. This year the Poke Weed has more than doubled in size with all the rain we've had, so she's had a lot to nibble on. As long as she (and others) are keeping it pruned back, I'll leave it there. One day I will regret it since they form very deep roots and are a challenge to get out. But she is well worth that trouble, but after that day she may be knocking at our door. 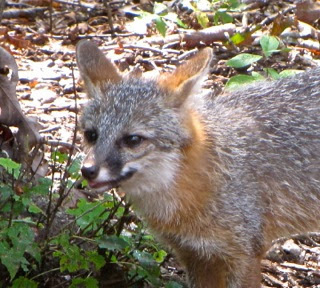 The Big Deal of wildlife enjoyment was a Gray Fox. What a treat to see a shaggy tail when I looked out of the screened porch. There was a Gray Fox at the veggie scraps enjoying a late lunch. I talked to it and didn't scare it off, so I ran into the house for the camera and began shooting photos through the window. We have had foxes in our yard many times, especially around the pond, but they are so fast you can never get a really good photo of them. This time was an exception. This fox seemed to really enjoy the cucumbers scraps. Whatever else it was choosing out of the pile was meticulously done. They certainly have preferred tastes. This precious creature was so alert to any noise and seemed to easily distinguish whether it was a threat or not. I was so surprised to see how beautiful the fur was when I cropped some of the photos for a close-up view. It looks like it just had a day at the spa. I was really excited that I was able to get a video. After it was finished with lunch, it came up to the deck to look around. Went right to the living room door and looked in which I thought was very strange. Then checked out the other end of the deck near the screened porch and left. What a wonderful surprise of the day! View Gray Fox Video. Some people are afraid when they see foxes during the day, thinking they have rabies, but they are diurnal (meaning they are out day or night). When we lived in Alabama, we had a female that had her den at the back of our property. You could hear the pups yelping when she was gone and in our yard eating the peanuts that we put out for the squirrels. What a quick source of protein for her while she was feeding the young ones. We've had some very hot days and then some really cool days. I just put on some slacks and a sweater since the temperature is 62 on the porch and a cloudy high of 77. Tonight will be 57. Is it really August in Virginia? Much of our July was this way also. The one thing that doesn't seem to have much of a variable is the rain we've been having since April. There must be some records being set in our area for this. I wish we could share our water with Austin, Texas. Although necessity is the mother of invention and Austin Water has certainly come up with some innovative ideas, like allowing customers to get cash to let their grass die and then wisely replant with a seed that is drought-tolerant (read story). It's been a really wet year, which has created some problems in our crawl space. Randal has been dealing with that for a few weeks fixing some things and then gathering info. You can't imagine how many varied opinions there are on wet crawl space issues. Our minds are swirling with options and it seems each of them has a group of folks online having issues with it. I guess each crawl space and home is going to have many variables. Homeowners have many things to think about as their homes begin to age, but our squirrels certainly seem to be carefree. They work hard at gathering food most of the day, play hard, and then they know how to take a break. They love the concrete benches on our property for a break now and then. We have four of them. This one is right behind the pond so a drink is nearby. We could certainly take some lessons from the squirrels. We need to balance our days the way the squirrels do. Eat, play and relax. It should all be in our daily schedules. Stress and adrenal fatigue wouldn't be so rampant, nor would it have such a huge impact on our health. Any trips on your upcoming calendar? Maybe we've visited the same area. If we did, you can be sure I took some photos. Check out the Travel Album and choose a state or international country.